Colts rookie linebacker Darius Leonard didn’t let a first-quarter knee injury slow him down long. Leonard continues to fly around and make plays all over the field in a serious campaign for Defensive Rookie of the Year. Leonard had a sack and was sound as a run defender and in coverage. Quincy Wilson had a nice near interception of a deep Ryan Tannehill pass, as he dropped back and slid under a corner route by Kenny Stills but wasn’t able to haul it in. Outside two errant throws at the end of the half, Andrew Luck continued his surgical ways, as he again picked apart a defense with big-time throws, quick passes and precision. He did suffer his first sack since Week 5 and had another wiped out by a defensive penalty, but it didn’t phase him. He led yet another come-from-behind victory. While Luck has avoided sacks by releasing balls quickly, the left side of his offensive line has also been a big part of that. Left tackle Anthony Castonzo and left guard Quenton Nelson were both excellent in pass protection. Castonzo had missed the first five weeks of the season and since returning to the starting lineup, he and Nelson have allowed just three hits and seven hurries combined. Tannehill threw a scrambling deep post route to Leonte Carroo, who just jumped higher than Colts defensive back Pierre Desir and ran for a 74-yard touchdown late in the second quarter. Tannehill had an up-and-down day, throwing a few passes that should have been intercepted. Kenyan Drake caught a flare pass out of the backfield and made two tacklers miss on his way to a 33-yard touchdown in the first quarter. Drake saw several more pass targets and showed off his soft hands – although he did have one drop – and ability to accelerate upfield quickly after making the catch and make people miss in the open field. Drake was even split wide and targeted on a third down. Cornerback Xavien Howard had himself a day. He was the interceptor on both of Luck’s wayward throws and allowed just 15 yards in coverage on the day. Neither of the interceptions was easy either, as he made fantastic plays to haul both of them in. Edge defender Cameron Wake was the one to break the sackless streak with his strip-sack of Luck on third down to force a field goal attempt by the Colts. He wreaked havoc on right tackle Braden Smith all game long. Luck is thriving in head coach Frank Reich’s RPO-based system and has delivered timely big-time throws. His precise arm with a wise usage of the run game was too much for Miami to keep in check. 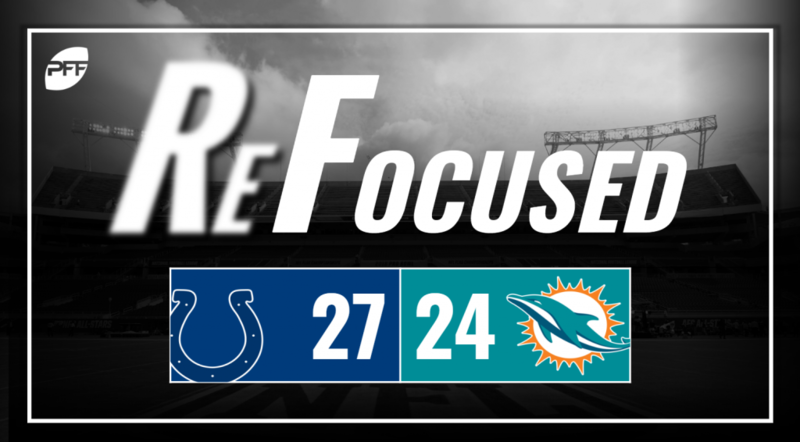 The Dolphins’ defense couldn’t do enough to holster Luck, and Tannehill couldn’t make enough plays to get the job done offensively.